In 2005, Montana ranchers drove the last band of sheep through the Absaroka-Beartooth Pass for summer pasture. The trip marked the end of a centuries-long journey and the waning of a traditional way of life. 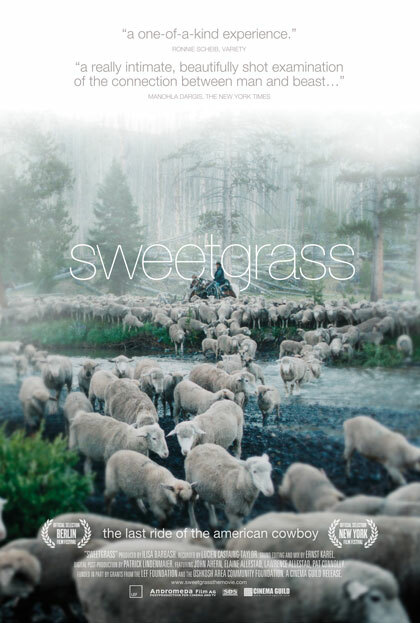 ‘Sweetgrass’, a film by Lucien Castaing-Taylor and Ilisa Barbash (a husband-wife team of visual anthropologists currently working at Harvard), documents one of the last of these journeys with lush, yet unsentimental intimacy. Castaing-Taylor and Barbash learned about Montana herding communities while living in Boulder, Colo. After some preliminary filming, they left for the town of Big Timber, children in tow, to document the annual sheep drive that has dwindled from a multi-family effort herding some 90,000 sheep, to a single family’s 3,000 head flock. The film doesn’t offer a didactic tutorial on the dying ritual: There are no voiceovers, and the only text appears as the movie’s end. Instead, Castaing-Taylor and Barbash allow the self-described cowboys and their sheep time on screen without the intrusion of an outsider’s introduction, proving the documentarians’ conviction that showing the unguarded and unscripted moments provides a richer, more truthful sense of their subjects’ experience. The process led Castaing-Taylor and a technical crew into the Absaroka-Beartooth pass for months of hiking, the entire time with a gigantic camera outfit (powered by solar panels) strapped to his back. The filming left him 20 pounds lighter, fully bearded, and limping due to the onset of degenerative arthritis in both feet. Over the next seven years, he and Barbash pared down more than 200 hours of footage into a feature-length film. The resulting images and soundscapes are raw and arresting: A farm hand slips the skin of a dead lamb over a live one in the hopes that the dead lamb’s mother will accept it; ewes level their startlingly dynamic gazes at the camera; the threats of bears and wolves weave through hours of bleating and wide shots of Big Sky country without eliciting any sensational reaction on the part of the cowboys. The noise of the drive, a jangle of natural sound captured by microphones pinned to the hired hands, is juxtaposed with long shots of the landscape and the herds, abstracted into a single, seemingly topographical mass. “Sweetgrass” premiered last February at the Berlin International Film Festival and opened at U.S. theaters last winter, with more theatrical engagements coming this spring. What distinguishes visual anthropology from documentary? LUCIEN CASTAING-TAYLOR: Traditionally, visual anthropology is different from mainstream documentary in [that it] explicitly foregrounds issues of cultural difference. I think it’s more that visual anthropology, like anthropology, is really interested in people’s lived experience, and cultural meaning around the world. And if there’s one thing that perhaps still distinguishes visual anthropology from documentary, or journalistic nonfiction, it’s this deep interest in everyday life, and people’s subjective, lived experience. How did you first learn about the community of Big Timber, and how did the project take shape? ILISA BARBASH: We were teaching at the University of Colorado in Boulder, we had just started a family, we had small children. With the kids we decided we needed to be a little closer to home. And the project kind of came to us. The rancher who’s featured in the film had mentioned to someone he was leasing land from that he, the rancher, was the last person to be trailing sheep up into the mountain in that particular area, and that somebody ought to make a film about him. That following summer we packed up the kids in the car and drove up there to film them. We always knew that we were going to shoot the journey up into the mountains, that that was going to be the center point. We were there for a couple of weeks and we would film the various preparations within the town: shoeing the horses, buying all the supplies that they were going to take up into the mountains from Costco, things like that. And then they started right out on July 5th. They drove the sheep, on Main Street, through the town of Big Timber and then up into the Beartooth-Absaroka wilderness range. The kids and I would help drive the sheep up along the road, and then at a certain point Lucien left us and went up with the ranchers into the mountainous part of the trail. What it was like to shoot in the mountains? LUCIEN CASTAING-TAYLOR: The area right north of Yellowstone National Park on public land in 1975 was turned into a federally designated wilderness area. Which means you can do almost nothing in there. You’re not allowed batteries and you’re not allowed vehicles of any kind, or bicycles even. I was reliant on solar panels [to power my camera] and solar panels are reliant on the sun, and sun is notoriously fickle, and you need hugely big solar panels to power the kind of camera that I had. We had to dedicate a mule, at least a mule, for the equipment that I took up into the mountains. And even without me they would have a pack string that could be up to 12-head of horses and mules. I sort of paid for it because I ended up having to have surgery on my feet when I came down, because I had no cartilage left, but that was my own stupid fault. ["Sweetgrass"] isn’t a traditional documentary in the sense that we never interviewed anybody, nothing was scripted, we never directed anybody, we never asked anyone to do anything again. What that kind of filmmaking methodology demands is this unbelievable kind of patience. And because we were interested, again, not just in people telling us about their lives, but people actually living their lives, I wanted them not to be too self-conscious about the camera. We also really cared, given that this is Big Sky Country and that the landscapes are what are so extraordinary about the aesthetics of the area, we wanted it to be as high resolution as possible. We took the best camera we could afford, which was this huge, massive sort of thing, far larger than what people use today, and I would mount it on my shoulder and blocked out about 180 degrees of my vision. But one thing that I did have was this harness that was attached to my back and all around my upper body, basically, and then had an aluminum bar that came up my spine and over the back of my head and had a spring attached to it, and the camera was suspended from that. I would never take it off except when I was sleeping. But even when I was eating, or when I wasn’t filming, I would never take the harness off and the camera would really never leave my shoulder. Paradoxically, it became part of my identity, like a kind of prosthetic extension of my body. You know, we all think of home video cameras now which are super small as ushering in era of informality and honesty and authenticity, but because of the size of them and because of their screens, it’s always obvious to everyone whether someone’s filming or not. With this monstrous camera on my shoulder it was never obvious, it just became part of me and people never knew if I was shooting. Can you talk a little bit about editing the film, particularly the sound editing? ILISA BARBASH: It ended up taking us seven or eight years to edit. We shot 200 hours of footage, which is a ratio of 100-to-1. We decided that the sheep drive was the most compelling portion of the film, and that we wanted to concentrate all of the energy of the film into that. Finally, about a year before the film was done, we got it down to five hours. LUCIEN CASTAING-TAYLOR: We collaborated with an amazing experimental musician and sound artist and anthropologist, as it happens, called Ernst Karel. He designed this incredibly complicated, orchestrated soundscape, which he essentially composed out of all the different tracks that we’d recorded for the film, and then came up with a surround-sound mix. But in addition to having this weird camera suspended from this harness, I also was working with all these wireless microphones, and which I would put on people, generally, very occasionally on a sheep, or a horse, or a dog. But it meant that people could be three miles apart from each, in different directions from me, and I would be getting this incredible signal of this super intimate, subjective, kind of guttural, really embodied sound. When you think of documentary, spoken word is just reduced to the content, the meaning, the propositional logic of what people are saying, but I was really interested in embodied sound, and what people are doing when they’re hacking, or coughing, or they’re crying or they’re just mumbling under their breath to themselves, these fragments of noise that are half-language and half not. In many ways, that’s a much more profound kind of noise than the words we issue when we’re trying to make sense. Ernst ended up mixing it so there was this aesthetic tension between this very proximate, intimate, acoustic eavesdropping with the very long, often distant kind of optical perspective, so you could see a landscape and not even see a human in it, or not even see a sound source in it necessarily, and yet be privy to all these synced sounds. When the herder John is trying to bed down the sheep at night, he’s going around them on his horse, trying to round them up and calling them, “Girly, girly, girlies,” and going off into some kind of half-dream, half-fantasy as he withdraws into his imagination. Then he goes up onto the horizon, and he’s about a mile away from me at that point and he’s riding along the horizon, wearing his cowboy hat, and he’s just a total cliche, like a joke, like an embarrassment of an image, this typical Western cowboy. And he’s singing to himself, and it just seems so fake; it seems so fictional, like this perceived image that we had from John Wayne, you know? And then he breaks his song, and you see the dog going up on the horizon in front of him and he says, “Get back,” just shouts it. So there are these occasional indications that what you’re hearing is synched, but you’re also supposed to doubt the sound and revel in this lack of naturalism. I grew up in Liverpool, which is super industrial, and all of my negative memories of childhood are of Liverpool and all my positive memories are of escaping to the Lake District, and I would see these gamboling lambs, but I would never really engage with sheep. And spending that much time with them, year after year up in the mountains, you start dealing with them as creatures, as bodies. So we tried in the editing, certainly I tried in the shooting, to do justice to them and their particular subjectivities. At times you’re looking at them as a whole, as an organism. When they go down Main Street, past RadioShack, it’s just this huge amount, you can only see them as a collectivity. Other times, like right at the beginning when an ewe turns her attention to the camera and just returns the gaze of the camera, of me, and implicitly of the spectator, there’s something very uncanny about that. You’re suddenly engaging with this live mind. Who would ever take that seriously until she stares at you in that unlimited, fixed way? What about the town of Big Timber? Can you talk a bit about its history and the challenges that have led to this notable decline in sheep ranching? ILISA BARBASH: [The town] got the name Big Timber because it was initially a logging community. The sheep ranchers have been there at least a hundred, a hundred and twenty years. LUCIEN CASTAING-TAYLOR: In the ’40s and ’50s there would be 50 bands of sheep up in these mountains every summer, and they were about a thousand head each. And then at some point in the ’90s there was just one last band. The average per capita American consumption of lamb is about two-thirds of a pound a year, as opposed to something like fifty six or sixty pounds of beef. Sheep are great in one way, in the sense that they are the one agricultural livestock species that has resisted being incorporated vertically into this agribusiness takeover of family ranching and family farming. But it’s just really, really hard to make ends meet. People have had to become hired hands and go work in the local palladium mine. The whole political economy, and the culture of Sweet Grass County and Big Timber have changed massively over the last 50 years.